So, I've decided that I'd rather write this than do my homework, so here goes nothing. On Monday (two days ago), LeTourneau's Belcher Center played host to The 5 Dragon Daughter, a sort of artsy show. I had heard good things about it, but had been unable to see it during its previous showings (it's because I don't have a car). So, it came to me! I finally got around to watching it on Monday, and it immediately became one of my favourite things ever. Without a doubt. for the entire production is. The basic premise of the show is this: it is an allegory for the Gospel. It is a story told over 12 Chapters (and a prelude and a prequel story). The story is told in several different ways. The main component is the narration. 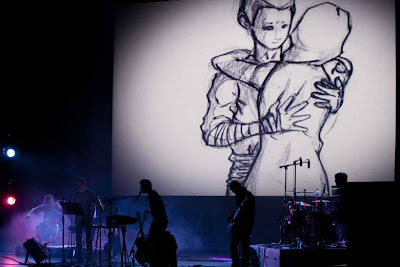 There is a voice that tells the story while, in the background on a projector screen, different drawings and sketches are displayed showing what is going on in the story at that time. It's kind of like a storyboard for a movie in that way. Every so often, the narrator will be interrupted and the story will be told through a song. The lyrics all have a powerful message behind them, and all of the songs serve to advance the story. That is the kind of music that I like: it's not simply filler to take up time between story segments, it is the story as well. 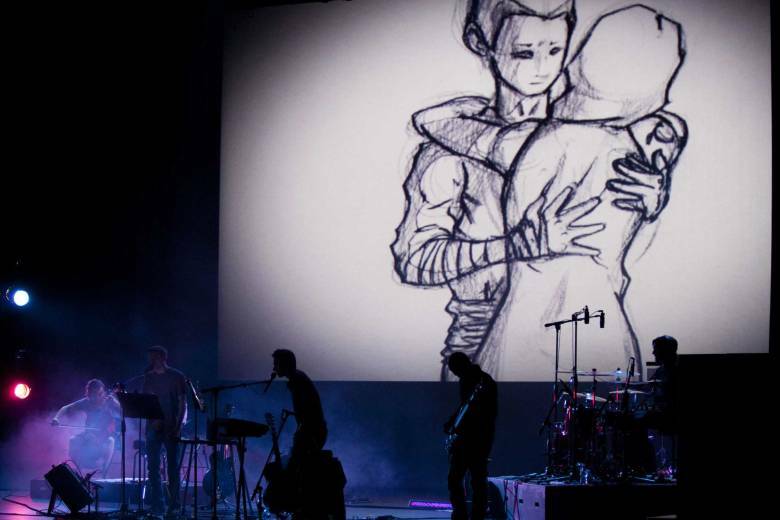 The lyrics to the songs are important to hear, so the projectors show the words while the songs are going on. I love subtitles, so it was a nice touch. During some of the songs, there will be dancers that come out. However, they aren't simply doing an interpretive dance of the songs. They are actually acting out what is going on in the story at the time, so like the songs, it is important that you pay attention and watch the dancers to follow the story. According to the show's official website, there are 15 artists and musicians that are involved in this production. Although the narration parts are prerecorded, the songs in between are all preformed live. There are 12 songs, all written for this show, and they are all in a variety of genres. There is a beautiful love song, a rock song, a hip hop song, and they are all preformed wonderfully. The instruments included an electric piano, a guitar, a bass, a violin, a cello (bonus points! ), a drum set, and probably others that I forgot. The illustrations do a fantastic job of explaining and describing what is happening in the story. Apparently there were over 400 different sketches, and I believe it. They were fairly roughly drawn, and rarely coloured, but I could almost always tell what they were trying to show. A couple of the pictures I couldn't figure out, but not many. This is what most of the show looks like. For more pictures, checkout their gallery. As for the story, it is the best one ever told: the Gospel. More or less. It's an allegory, so there are some differences, obviously. But it is fairly obvious what it's supposed to mean. However, just in case you couldn't understand what each part was supposed to mean, they handed out neat little allegory guides. The allegory is about a kingdom that is waiting for the son of the Great King to come and claim the throne. This Son is the main character, but before he can take the throne, he must first be married to a girl who has been enslaved. He goes on a quest to free her, and some awesome stuff happens. 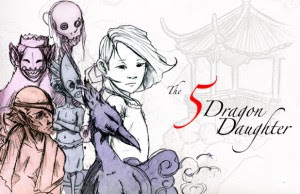 It is called The 5 Dragon Daughter because she is the daughter of the 5 dragons of the land (sort of. They ate her dad...). The Son's quest involves him finding all 5 dragons. Because the story is, you know, the Bible, I'm sure you can figure out what happens at the end. This show was conceived here in Longview, and its first showing was last summer. However, in less than a year, it has become a very well designed show with impressively high production values. The showing was, unfortunately, not perfect. About 5 minutes in, the sound suddenly cut out, and the tech crew had to scramble to fix it, which took about 10 minutes. Or maybe it just felt like 10 minutes. I don't really blame anyone for that though, because they had never performed at the Belcher Center before, and as far as I know, they had never been anywhere but Crossroads Community Church. However, if that ever happens again, I would recommend that someone go on stage and do something to keep the crowd busy, rather than let there be an awkward silence followed by nervous chatter. I cannot recommend this show enough to everyone. It makes you think about the Christian faith and what's really at the core of it, by presenting it in a different setting than you have ever heard it before. Even if you don't care about that, it's still a really good story presented well. I think that everyone should have a chance to see this show and that it's good enough to be shown anywhere. Do yourself a favour and find some way to see this show! I saw it again two years later, and it's still fantastic! Go!